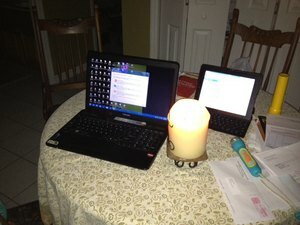 And, for those of you who have been won over, here's my iPad at work on my kitchen table at 11PM, no power, typing by candle light, laptop running off the iPad hotspot. It works, it actually works...! Hey, maybe not news everywhere, but on St. George, it's a first for me to be able to be up and running with no electricity, no DSL, nothing but the iPad and battery power...!